How to create a shared company Inbox in Outlook? If your company uses a single POP3 email account for receiving general inquiries from customers and business partners, you’d probably like to know how to make it accessible for a larger group of employees via Microsoft Outlook. In this short tutorial I will show you how to create a shared company Inbox in Outlook without investing huge sums of money in servers and costly server-dedicated software. All you need to achieve this goal is the free trial version of CodeTwo Public Folders installed on all machines in your office. To cut a long story short, CodeTwo Public Folders lets you create public folders in the Outlook folder tree that can be easily accessed by your office-mates from other PCs. It also allows sharing private Outlook folders with others and set detailed access rights for all shared items. Today we will cover only a small selection of use cases that this powerful collaboration tool has – a shared company inbox. If you already have CodeTwo Public Folders installed on all machines in your network, we can move on to configuring the shared inbox. Choose one workstation in the office that will be responsible for receiving mail from your general email address (e.g. info@company.com) and configure an Outlook account on it that will use the general email address. If you need any help with configuring a POP3 account in Outlook, you can use a free tool by CodeTwo, CodeTwo Outlook AutoConfig that will do it for you automatically. 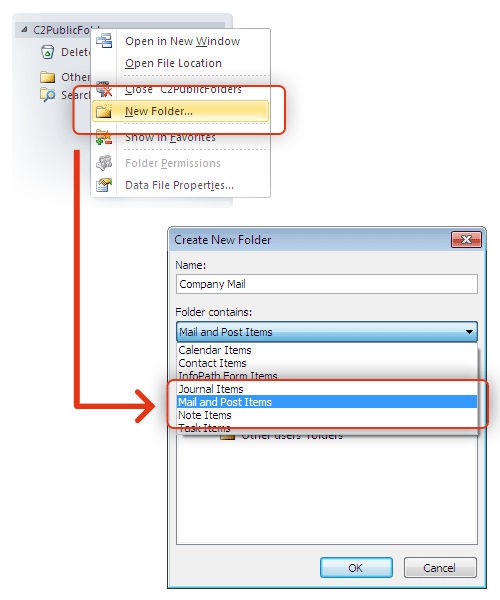 Create a public mail folder in the C2PublicFolders folder tree that will receive data from your general email address and act as a common Inbox. Create a new rule in Outlook that will move all received messages from the default Inbox to the public mail folder created in the previous step. 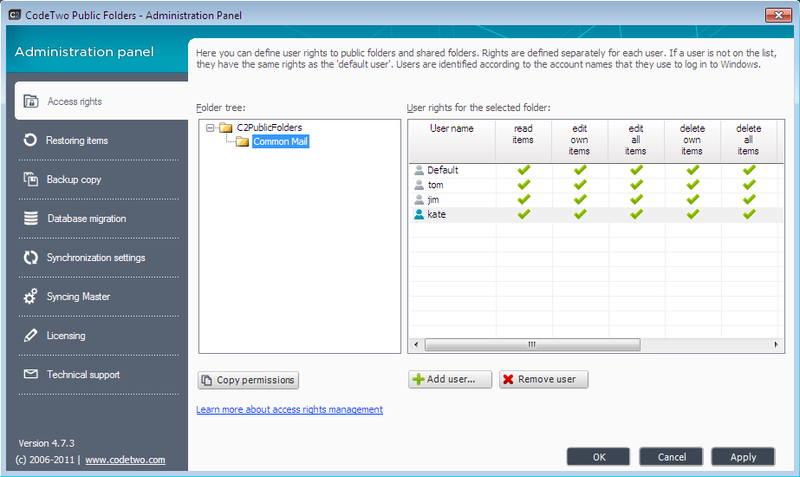 In the Administration Panel of CodeTwo Public Folders set access rights for the common Inbox according to your needs. The Administration Panel is located on the machine equipped with the Syncing Master. You will find it in the Windows Start Menu. Read more about CodeTwo Public Folders Administration Panel and setting access rights to shared folders. The example described in this article is only one of many team work scenarios that can be applied using CodeTwo Public Folders. For more examples of application see the CodeTwo Public Folders product page.